Research Description: Regardless of whether landfill gas (LFG) is being flared or converted to energy (electricity, compressed natural gas, or liquid hydrocarbon fuels), contaminant issues must be addressed to minimize emissions and increase equipment lifetimes. The common contaminants include halides, sulfides, and siloxanes and the economical and environmentally sound removal of these contaminants is an increasingly timely issue. The goal of this project is to develop and evaluate an effective scrubbing process for cleaning the LFG prior to further processing. Scope of Work: The goals of this project are to develop and evaluate an effective scrubbing process for cleaning the LFG prior to further processing and to determine acceptable tolerances of certain downstream operations to certain contaminants. The long-term goal of this line of research is to provide an economically viable approach for meeting EPA regulations on landfill emissions. With this information, we will propose process improvements based on the parameters contributing to the high costs. The proposed effort leverages previous efforts on the demonstration of syngas production from LFG funded by the Hinkley Center and the Florida Energy Systems Consortium (FESC) as well as the design and application of selective FTS (production of diesel and jet fuel) funded by FESC. 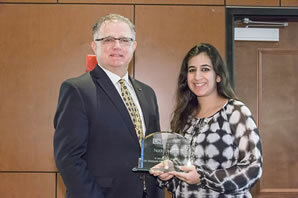 (L): Nada is with the USF COE Dean (Robert Bishop) during the award of a plaque for her USF GSS fellowship. (R) Tony is a junior Chemical Engineering student working on this project. 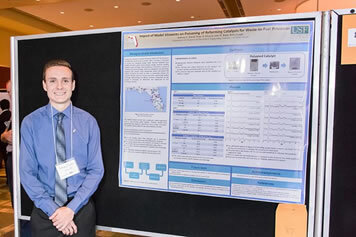 He recently presented a poster on this project. Our first TAG meeting was held on April 13, 2016. Our second TAG meeting was held on November 9, 2016. We thank the following people for being members of our TAG. Ralph Hirshberg Principal Civil & Environmental Consultants, Inc.